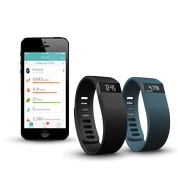 Since launching its first fitness-tracking device more than six years ago, Fitbit (see disclosure) has pitched its products as primarily health and wellness devices. But now it’s creeping into the general lifestyle category. On Thursday, the startup launched a second wristband, the Fitbit Force, which not only tracks activity and sleep, but displays the time and will, ultimately, show incoming phone call notifications. The company said the new notification feature will not be available at launch but will come “soon” with the software’s next update. “We’re still very much focused on getting people healthier, but if they’re wearing something on their wrists it would be nice for it to do a little more,” said CEO and Co-founder James Park. The Force resembles Fitbit’s last device, the Fitbit Flex wristband, and costs $129.95 (which is about $30 more than the Flex). But instead of just displaying four lights indicating how far a user has progressed towards her daily activity goal, its OLED display (which can be changed via a side button) shows the number of steps taken, distance traveled, stairs climbed (thanks to an altimeter), calories burned and a watch face. Like the company’s other devices, it also tracks a user’s sleep and syncs with a smartphone via Bluetooth. Wearable technology is still in its early days but the market is heating up. Berg Insights predicts that over the next few years, the number of wearable devices sold will grow eightfold, from 8.3 million in 2012 to 64 million in 2017. Fitbit was an early mover but now faces competition from Nike (s NKE) and Jawbone’s fitness-tracking bands, a new crop of smartwatches — including Basis’ health-focused wristwatch — and mobile apps that also offer health-tracking features. The startup doesn’t share the number of devices it has sold, but says its products are available in 20,000 North American retail stores and across 27 countries. In August, the company said it had raised a $43 million Series D round, bringing its total amount raised to $66 million.